MLB award season continued Monday night with an award that everyone saw coming. 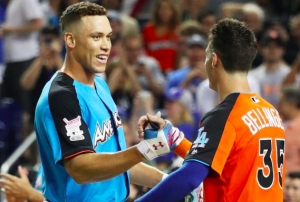 New York Yankees outfielder Aaron Judge took home Rookie of the Year honors in the American League while Cody Belling was named National League Rookie of the Year. Both players won the award unanimously. It was the first time since 1997 with Scott Rolen and Nomar Garciaparra that both Rookie of the Year awards were unanimous. From the start of the season, Judge put on a show for fans everywhere, hitting 52 home runs, many of which were crushed far beyond the outfield wall. He also hit .284 with an OPS of 1.049, helping the Yankees reach the ALCS. Andrew Benintendi of the Red Sox was a distant second place in the voting. While Judge earned all 30 first-place votes, Benintendi received 23 of the 30 second-place votes. Trey Mancini of the Orioles finished third. Bellinger, on the other hand, didn’t make his big league debut until the end of April. But as soon as he came up, he made an immediate impact and was one of the league’s most productive hitters. On the season, Bellinger hit .267 with 39 home runs, posting an OPS of .933. He also showed versatility by moving back and forth between first base and the outfield. He became a big reason why the Dodgers reached the World Series. Paul DeJong of the Cardinals has the distinction of finishing second to Bellinger in Rookie of the Year voting. DeJong received 15 second-place votes and 11 third-place votes. Pirates first baseman Josh Bell finished third after receiving 10 second-place votes. Bellinger joins a long list of Dodgers who have won Rookie of the Year, 18 in all, including last year’s winner Corey Seager. Judge, meanwhile, may not yet be done collecting hardware. He is a finalist for American League MVP along with Jose Altuve and Jose Ramirez. He would be only the third player to take home both awards in the same year, joining Fred Lynn in 1975 and Ichiro Suzuki in 2001.